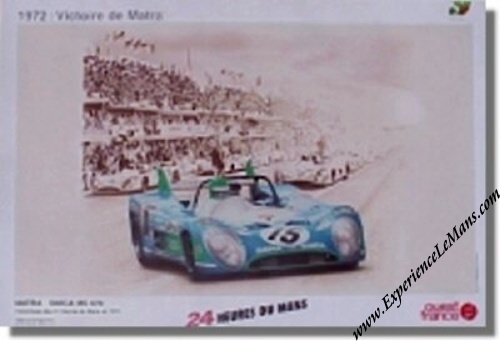 1972 Ouest France 24 Hours of Le Mans Matra Poster. Issued by Quest France, a local Le Mans newspaper, it shows the winning Matra of Henri Pescarolo and Graham Hill at the start of the 1972 edition of the 24 Hour race. Issued in the late 1990's. For the full results of this race, please see 24 Heures du Mans results 1972.